The Remote clipboard snippets feature makes it quick and easy to paste text snippets to your Mac or copy them back to your Mac's clipboard. What can I do with Remote snippets? Keep useful information like postal and web addresses handy so that you don't need to remember them. Copy a few email signatures and greetings, and add them to your emails with a quick touch of the screen to save time manually writing them every time. Create smart snippets with dynamic content to paste your clipboard content pre-formatted. To get started with Clipboard Snippets, take a look at the example page of snippets we've created. In Alfred's Preferences on your Mac, go to the Remote preferences and click on the + button at the bottom of the Remote pages sidebar and select Examples > Clipboard Snippets. 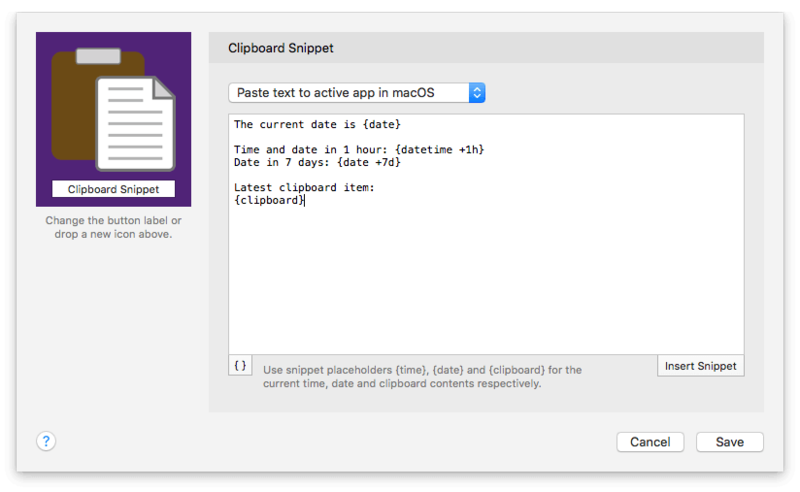 Add a Clipboard Snippet action to your Remote page and double-click it to bring up its preferences. Place the text into your macOS clipboard. To populate the content of your snippet, write in a new snippet or use the text from an existing clipboard snippet by clicking "Insert Snippet". You can include dynamic content like date, time and clipboard content to your snippet, in the same way you can add them to Alfred's Snippets on your Mac. Click the curly brackets in the bottom left to quickly add formatted date and time examples, and see how to add dynamic placeholders to your snippets. Change the button label to name your action in the box on the left. 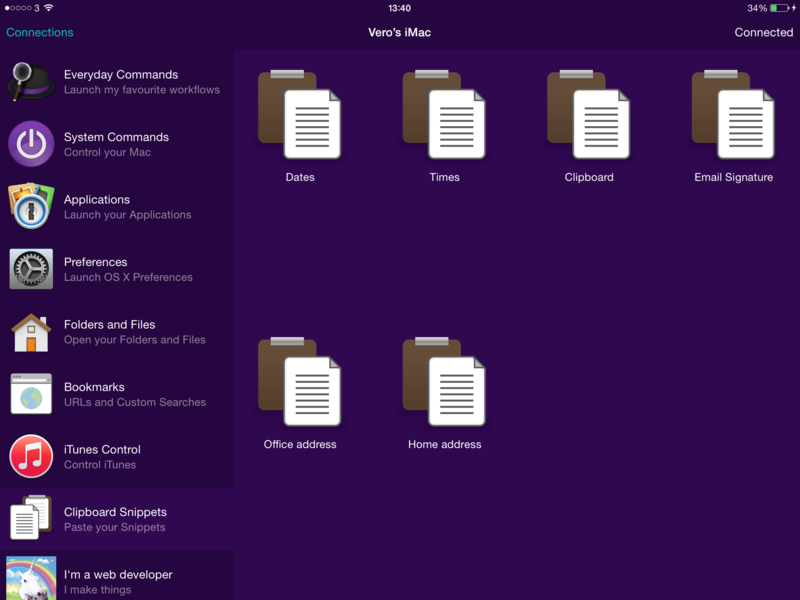 Optionally, you can also drag an image over the clipboard icon to customise your action icon.